The oxpeckers are two species of birds -- the red-billed oxpecker and the yellow-billed oxpecker -- that live in sub-Saharan Africa. The oxpeckers perform a symbiotic relationship with the large, hoofed mammals of the area: giraffes, antelope, zebra, Cape buffalo and rhinoceroses. There is some debate as to whether the relationship between the oxpecker and its host truly is symbiotic, or whether the oxpecker is semi-parasitic. A bison -- in Africa this ox-like creature is known as the Cape buffalo -- that is serving as host to the oxpecker does receive some benefits, although the overall merit is speculative. Ticks and other insects feasting on the buffalo are removed by the oxpecker. Oxpeckers leave no crevice untouched, and will even work their ways into their hosts ears to remove insects, earwax and parasites. In addition, the oxpecker will eat diseased wound tissue, keeping wounds clean as they heal. Oxpeckers also will hiss when they become alarmed, and can alert their host --who is a prey mammal-- to potential danger. The oxpecker will spend his entire life on his hosts, except for nesting, which occurs in cavities of trees. In this relationship, the part of the oxpecker is obligate; he is dependent upon the host as a source of food. In addition to the meals he receives every day, the oxpecker also is protected from many predators while on the relative safety of the host. Oxpeckers consume dandruff and scar tissue, and have been known to open up wounds on their host to eat the blood and scabs, potentially slowing the healing process. There are various types of symbiotic relationships. Mutualism is a symbiotic relationship that benefits both organisms. 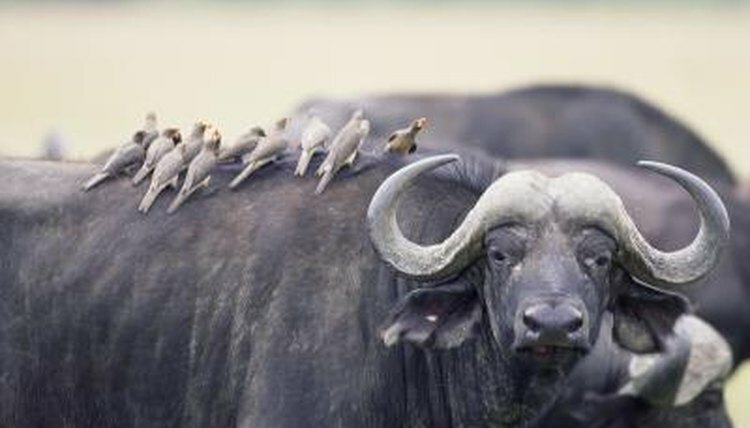 In the case of the relationship between the oxpecker and his bison-like hosts, the oxpecker benefits from having a steady supply of food, while the host benefits from having parasites cleaned from her body. Some scientists debate if the relationship truly is mutual however, as the host does not benefit in the same way, if at all, as the oxpecker. Animals, such as the elephant and topi, actively brush away oxpeckers, signalling that there may be little benefit to their relationship. The red-billed oxpecker in particular is suspect of being semi-parasitic. The reduction in tick-load of the host animals for the oxpeckers has not been overwhelming. The oxpecker is inclined to eat ticks that already have fed on the host and, therefore, are full of blood; this fails to help the host. The oxpecker's inclination to eat the blood and wound tissues of his host is argued in two directions: that it either slows the healing process or that it keeps the wound clean and aids the healing process. Studies support both arguments, and an official labeling of the oxpecker as parasitic has not occurred. Oxford Journal of Behavioral Ecology: Red-billed Oxpeckers: Vampires or Tickbirds? NCBI PubMed: Interactions Between Red-billed Oxpeckers, Buphagus Erythrorhynchus, and Domestic Cattle, Bos Taurus, in Zimbabwe. What Is the Relationship Between an African Tickbird & a Giraffe? What Kind of Animals Do Elephants Interact With?